Comments: $30 per box. Buyer pays for shipping. 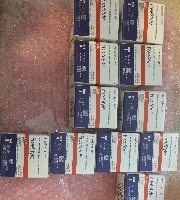 17 boxes of brand new, unopened, unused, diabetic blood glucose test strips. Expiration dates range from 12/2019 - 6/2020. 50 strips per box. 2 @ 12/31/19, 2 @ 1/31/2020, 2 @ 2/28/2020, 4 @ 3/31/2020, 1 @ 4/31/2020, 3 @ 5/31/2020 & 3 @ 6/30/2020.